If anyone wants to make an amazing Tunisian blanket then I highly reccomend this one by Laura Pavy, it is beautiful. This pattern is for a 12 inch cushion cover. Stitches used are: Tunisian Simple Stitch (TSS), Chain, Slip stitch (SlSt), Treble Crochet (Tr), Magic Ring. 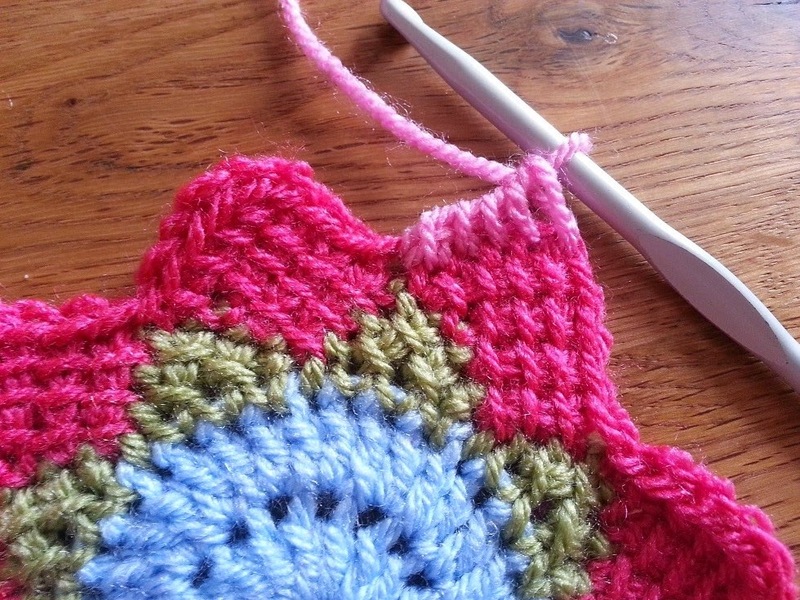 The pattern might seem quite complicated for a novice at Tunisian crochet and I am no expert at writing Tunisian patterns but if you follow every step and read the pattern carefully I hope you will find it fairly straight forward. TSS is made by a Forward Pass and a Return Pass. For the Forward Pass, insert your hook in the next vertical bar (or other stitch where stated) Yarn over, pull the hook back through to the front of the stitch. Carry on this way until the end of the Row or for the number of stitches stated. 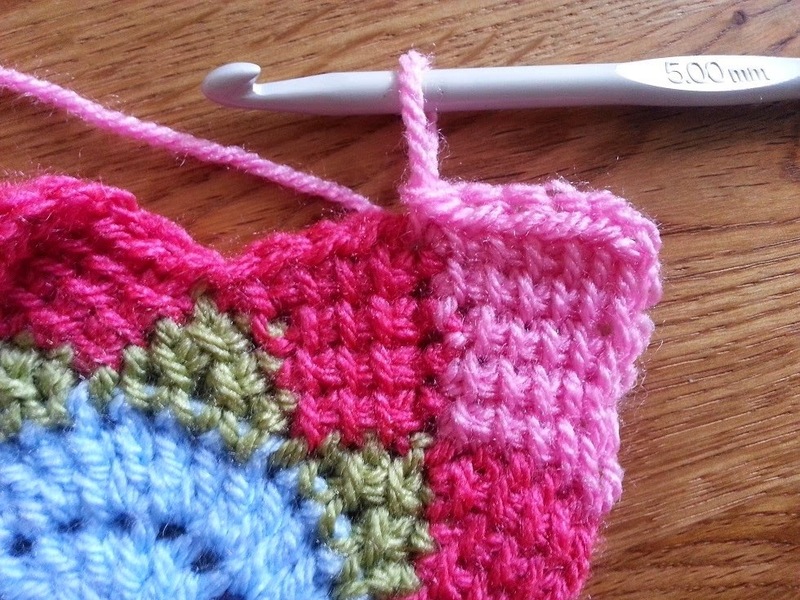 Return pass is made by yarn over and through the number of loops stated on your hook. I have included some photos to help get you started and help you to recognise the vertical bars for the Forward pass of TSS. You will need various colours of your choice of yarns. I have only tried this pattern with Double Knit weight yarn however I see no reason why it would not work with a different weight. Tunisian Crochet is best worked with a loose tension, therefore use the hook size that suits your tension best, I use a 5mm hook with DK weight yarn. Make a Magic Ring, Chain 3 (counts as 1 Tr) and crochet 15 Tr into the ring. Join with a SlSt to the 3rd Chain of your initial Chain 3. Pull the Magic Ring closed. Chain 3 (counts as 1 Tr) and Crochet 1 More Tr into the same stitch. 2 Tr in each stitch around. Join with a SlSt to the 3rd Chain of the Chain 3 at the beginning of the round. Change colour by drawing up a new colour in the loop from the last SlSt. Insert hook in next Tr, yarn over and back through (2 loops on hook). Return pass – Yarn Over and through 1 loop, yarn over and through 2 loops. Yarn over and back through (2 loops on hook). Insert hook in next Tr, yarn over and back through (3 loops on hook). This is a SlSt row (remember to keep the stitches nice and loose). *Insert hook in next vertical bar, yarn over and through both loops on hook* x 3. Make one last SlSt in the next Tr. The loop now left on your hook is the starting point of the next Entrelac Triangle. Repeat from Row One to Row Four until 8 Entrelac Triangles have been made. The last SlSt of the round will be made in the first stitch of the round. Fasten off. Starting in any of the Triangles of the previous round, Insert your hook in the First SlSt of that triangle (at the point of the triangle) and draw up a loop of a new colour. Draw up a loop in each SlSt along until you have 4 loops on your hook. Return Pass – yarn over and through 2 loops along until 1 loop remains. Draw up a loop in each vertical post along (4 loops on hook) and one last loop in the second row of the adjacent triangle. Draw up a loop in each vertical post along (4 loops on hook) and one last loop in the third row of the adjacent triangle. Draw up a loop in the next four vertical posts (4 loops on hook). There should be one extra vertical post as we increased in the last return pass. It is quite hard to see, it is where my needle is showing below. Draw up one more loop in this vertical post and one last loop in the fourth row of the adjacent triangle – the corner slip stitch of that triangle (6 loops on hook). This is a SlSt row, so SlSt in each stitch across (in the same way as with Row Four of the previous Entrelac round) making your last SlSt of the row in the corner SlSt of the adjacent triangle. This last loop on your hook is the starting point for the next Entrelac ‘Square’. Repeat around 8 times. Fasten off. Starting in the corner of any square from the previous row, draw up a loop in the first SlSt of that square. Draw up a loop in each SlSt along (5 loops on hook) and one last loop in the first stitch of the adjacent square (6 loops on hook). Draw up a loop in each vertical post along (5 loops on hook) and one last loop in the next stitch of the adjacent square (6 loops on hook). Draw up a loop in each vertical post along. As this is following an increase row remember to draw up a loop in the very end vertical post (as with Row Four of the previous Entrelac Round) and one last loop through the next stitch on the adjacent square (7 loops on hook). 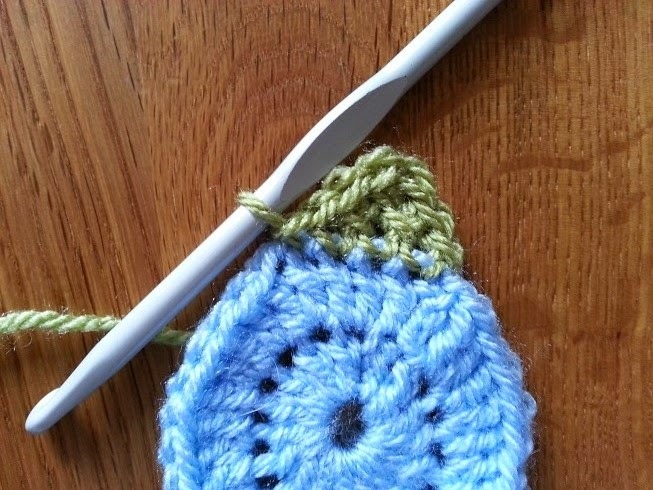 Draw up a loop in each vertical post along and one last loop in the fifth row of the adjacent square – the corner slip stitch of that square (7 loops on hook). SlSt along (as with Row Five of the previous Entrelac Round) making one last SlSt into the corner SlSt of the adjacent square (the same SlSt that was used in the previous row). This last loop on your hook is the first loop for the next square. Repeat from Row One to Six of this Entrelac Round until you have made eight squares. Draw up a loop in the first SlSt of any of the previous row of Squares (in the corner). Draw up a loop in each SlSt across (6 loops on hook). 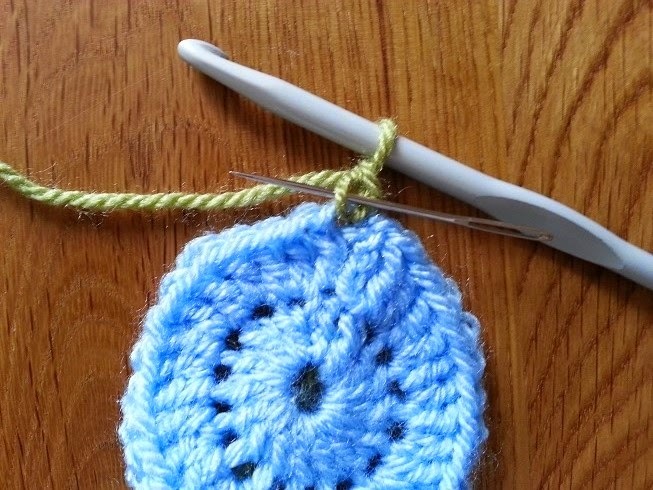 Draw up a loop in the first stitch of the adjacent square (7 loops on hook). Return Pass – Yarn over and through 1 loop (*yarn over and through 2 loops* repeat until 1 loop remains). Draw up a loop in each vertical post across and 1 loop through the next stitch of the adjacent square (9 loops on hook). Return Pass - Yarn over and through 1 loop (*yarn over and through 2 loops* repeat until 1 loop remains). Return Pass - Yarn over and through 2 loops along until 1 loop remains. SlSt across making one last SlSt into the corner SlSt of the adjacent square (the same SlSt that was used in the previous row). 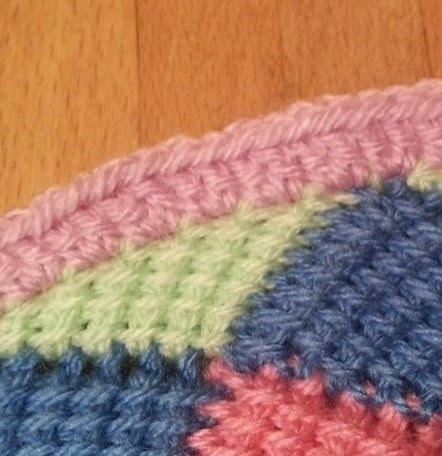 This is the last round of Entrelac in the pattern and rounds off the edge of the squares. This is done by making a decrease on the return passes. Draw up a loop in the first SlSt of any of the previous row of Squares (in the corner). Draw up a loop in each SlSt across (8 loops on hook). 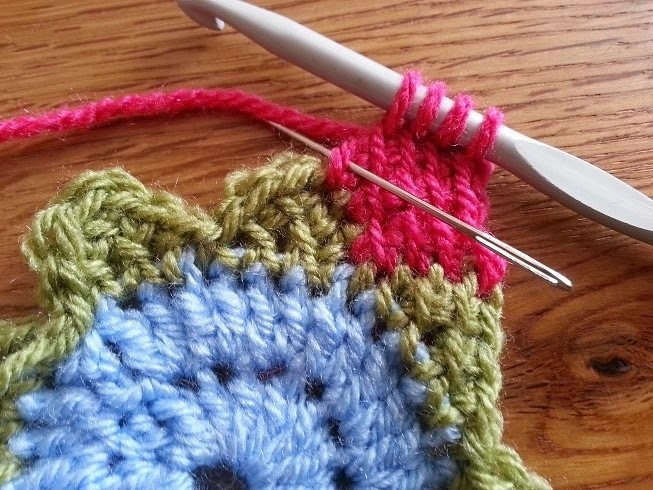 Draw up a loop in the first stitch of the adjacent square (9 loops on hook). Return Pass – Yarn over and through 2 loops x 6, Yarn over and through the last 3 loops. As we have made a decrease on the return pass of the previous row, skip the first vertical post that you can see and start drawing up loops from the next vertical post along. This is the same for each of the next few rows. Return Pass – Yarn over and through 2 loops x 5, Yarn over and through the last 3 loops. Return Pass – Yarn over and through 2 loops x 4, Yarn over and through the last 3 loops. Return Pass – Yarn over and through 2 loops x 3, Yarn over and through the last 3 loops. Return Pass – Yarn over and through 2 loops x 2, Yarn over and through the last 3 loops. Return Pass – Yarn over and through 2 loops, Yarn over and through the last 3 loops. Return Pass – Yarn over and through 3 loops. SlSt into the next SlSt along (the corner SlSt of the next adjacent square. Repeat from Row One to Seven around. 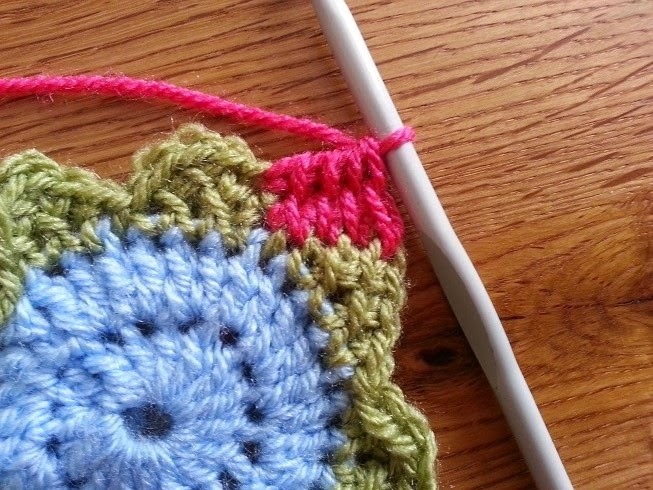 The next few rows of the circle are made using normal crochet stitches. Join with a SlSt into the top of the Chain 3 at the beginning of the round. Rows 2 - 4 – Change colour. Chain 3, 1 Tr in each stitch around. Join with a SlSt into the top of the Ch3 at the beginning of the round. 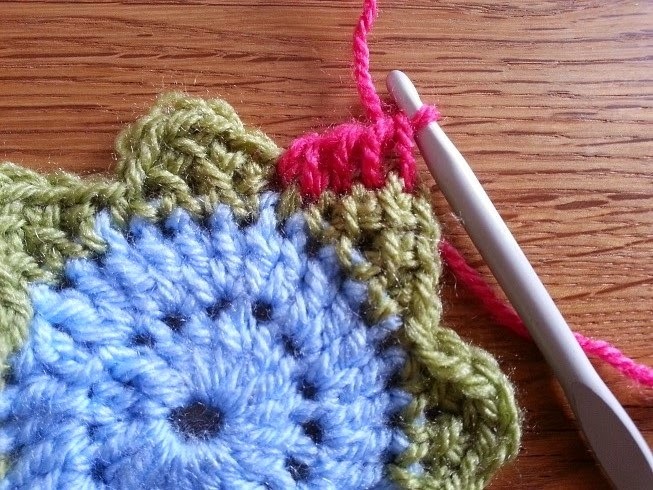 Join both sides of the cushion together either by crocheting them together with a rows of Double Crochet or sew them using whip stitch, remembering to stuff it as you go. Thank you for trying this pattern, please leave me a comment below if you need help with it and I will try to get back to you as soon as I can. Reading the last line on your page, "Please respect my copyright", but you didn't respect the original designer of this pattern Laura Pavy. Your base pattern looks and works up eerily similar to her Sunny Daze pattern design. I rather pay for her pattern then follow a poacher. This brings into question all your other "designs" as being your own. So by those standards, no one can sell patterns for hats because someone made a base pattern and no one credits them. No one can sell patterns for boo vests, anything with granny squares or anything really because someone else came up with a base pattern. 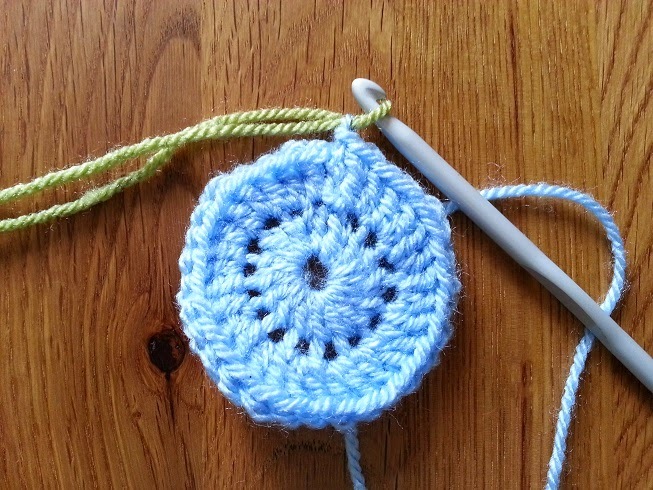 This is obviously a simple Tunisian Entrelac in the round, anyone that can Tunisian or work in the round can obviously do this. Above Unknown, this is my way of thinking, and using a stitch to make something different should well be acceptable. The "anonymous" that is kevetching above should realize that her jealousy of someone doing something attractive with the tunisian stitch is likely and as long as it isn't word for word, it isn't copying. Abi, the person complaining must also have poor sight, I can see numous differences between her's and yours, number count, shape of the diamond etc.. Thank you Abi for your pattern. I doubt you will approve my last comment to be posted on this blog of me calling you a poacher of Laura Pavy's design Sunny Daze, so let me say this. Your name and blog is being passed around all social media crochet sites as a poacher and stealing someones copyrighted works. The publishing company will catch up with you soon enough. Happy hooking! Wow harsh words for someone that can't see this is a fairly different pattern! I bought Sunny Daze, It is not started as this one is and even is not really the same at all. You go buy Sunny Daze then come back and read this pattern you will realize they are totally different concepts of start to finish, besides sunny daze is only a tss circle any one with experience in tunisian crochet (Like ME) could have figured out on their own eventually any ways from the various tuts out there on TSS circles! Thank you for this pattern. I have just started with Tunisian crochet and was looking for a small project. What is the difference in the Return Pass by just going through 1 loop first, as you start the return pass, and then through 2 stitches and going through 2 stitches/loops all the way along the Return Pass? Does it help with the increase? Just when I was learning Tunisian simple stitch the tutorial I watched said always - Yarn over through 1 loop, then yarn over through 2 loops at a time to the end of the row. Hope that makes sense. Thanks! 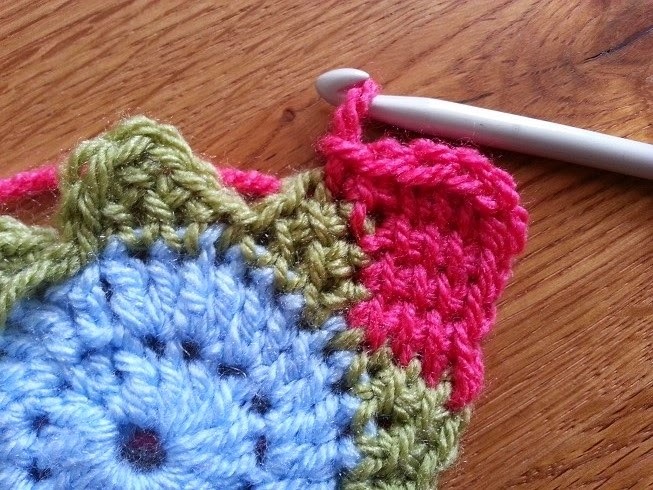 I've been a crocheting for 45 years and this is similar to the Afghan stitch. I think it's very exciting to do this stitch, anything new is wonderful. The instructions were very clear. Thank you. Thanks for this pattern. I've just started with entrelac crochet and really enjoy it. I am on the last entrelac round of this pattern and I'm finding my work will not lay flat. Could the reason be my hook is too small? I'm working with a 3 ply yarn (recommended hook size 4mm) and a 5mm hook. Any advice?? Hi Abi, So sad that we have to judge people so harshly. So many books out there that give you many ideas and stitches. How can't we not come with similar ideas. I have been crocheting for more than fifty years. A Korean neighbor in the 80's taught me how to do the basic for tunician. Before we could find books on it. I didn't even know the correct name for it. I have done many designs and later see something very similar that I did years ago. I like to design but I never sell or post much exactly because of what happened to you. SO SAD!!!!! I wish we could share more patterns and I also respect the ones that sell there work. 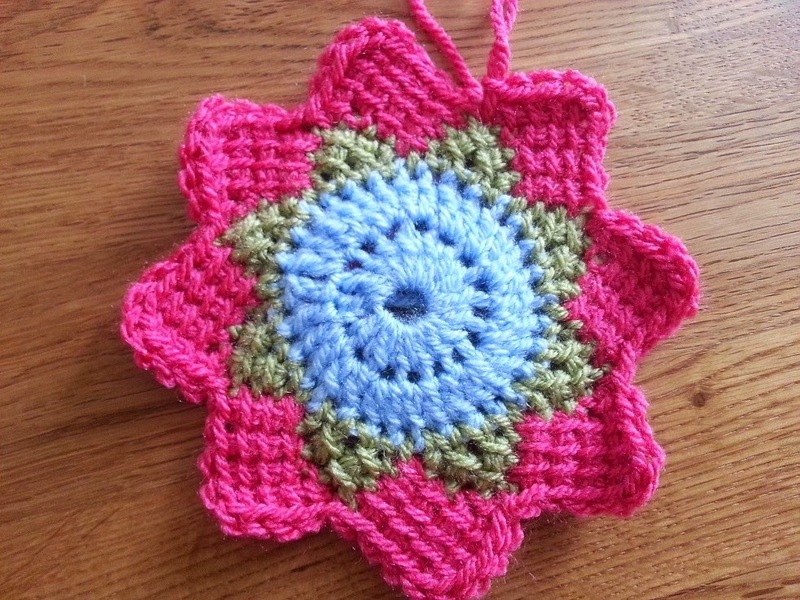 I have taught crochet in a craft store, I have seen students come back with there own ideas just in the second class. We as women should help each other instead we like to put each other down. Take care, bless you and continue with this wonderful art that was dying. We all need to come together and continue to recover and share this art. I am so very sorry for the negativity that you have experienced with this pattern. I appreciate you sharing your knowledge freely so that those of us who are still learning have the chance to build on your experience. There have always been and will always be similar patterns all over the net and in books. It is a sad thing that we can't have a hobby without drama. Thanks again, truly enjoy your blog and patterns. I paid for the Sunny Daze pattern, and have to tell you that I found it very hard (ok impossible) to be successful without actual photos to show where to place the crochet hook to make the stitches come out right. 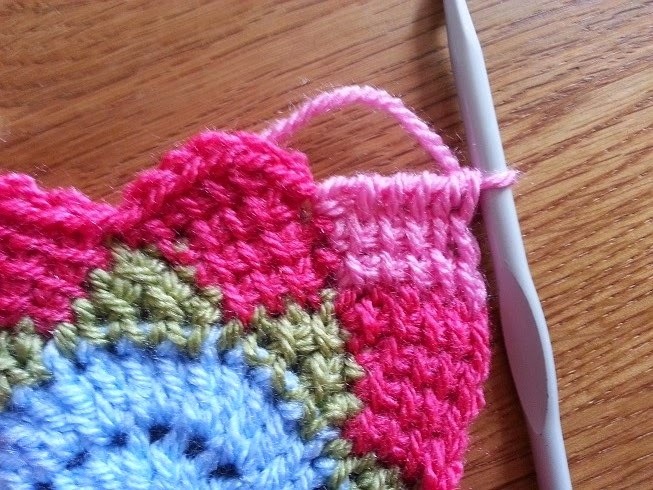 I thought I'd try to at least use her highlighting technique on a square entrelac project, but I couldn't figure out if I was supposed to crochet it in, carrying the yarn behind, or use a yarn needle after the fact. There is a YouTube site that has a very good video on this technique (very similar to yours), but it's in German. I'm thinking between your photos and that other video, I might be able to complete this project. Perhaps then I'd be able to give Sunny Daze another try. Thank you for sharing this lovely pattern. It was easy to follow and I produced a beautiful piece of art! Love it and long live Tunisian Crochet! I have bought some patterns but i could not easily make out by going through. Thank you, you have made it very visual and easy to follow. These day and age everything is open source. So creating the pattern that some one has done before does not mean anything. Human mind is creative and has infinite potential. You have used it to share with who can make use and enjoy. I am glad you have shared. Wow! 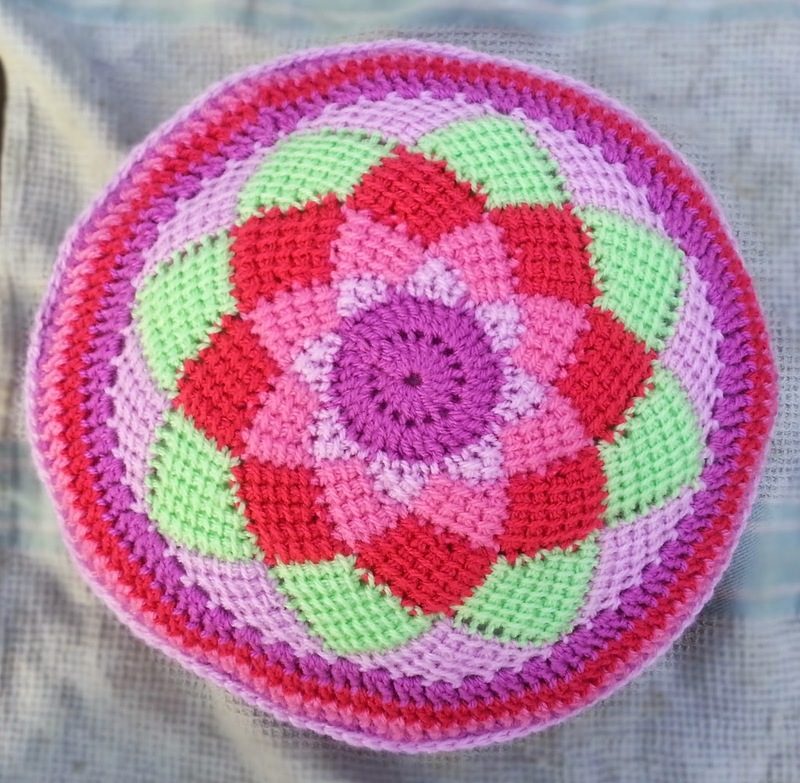 Thanks for posting this pretty entrelac pattern in the round. 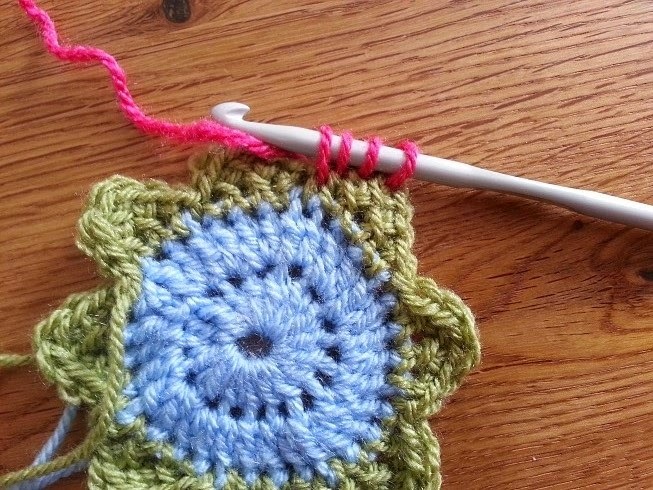 I am going to try this with smaller yarn and a small hook and make some flowers for baby hats (I donate to a hospital). I am new to tunisian crochet and entrelac and I have tried and tried to come up with a way to do it starting in the center, but I gave up after trying for a long time. Oh, and to "Anonymous" who nastily accused you of poaching...."Go home, Anonymous. You're drunk!"